Every. Single. Recipe. – Two-Fer! Spicy Chipotle Dishes from Clean Eating with a Dirty Mind! And a MAYO bonus! This is where the spicy delicious lives!!! Right here! So clearly it did not take me long to figure out of the very few non-dessert type recipes, these two needed to be taken on as quickly as possible! 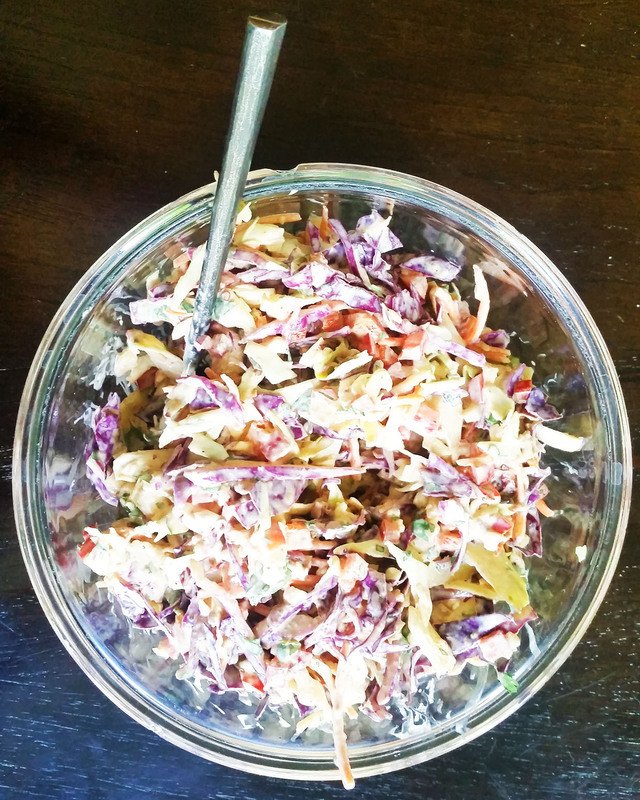 Chipotle Cole Slaw (page 86) and Chipotle Chicken Salad (page 102) are both big winners! Not only do they big time deliver on that smoky, spicy goodness of Chipotle pepper deliciousness, but they are quick and easy recipes! Both would be great for a crowd or kept on hand for quick lunches during the week! The slaw is VERY spicy! In fact, I may have to tone down the amount of pepper in my next batch, but what a great twist to cole slaw! I added extra lime juice to help tame the heat…i think serving a few slices of fresh avocado along with it would be great! (slaw is on the left in the pic above and also on the left). The chicken salad is fantastic! This is the spice I am always looking for in chicken! 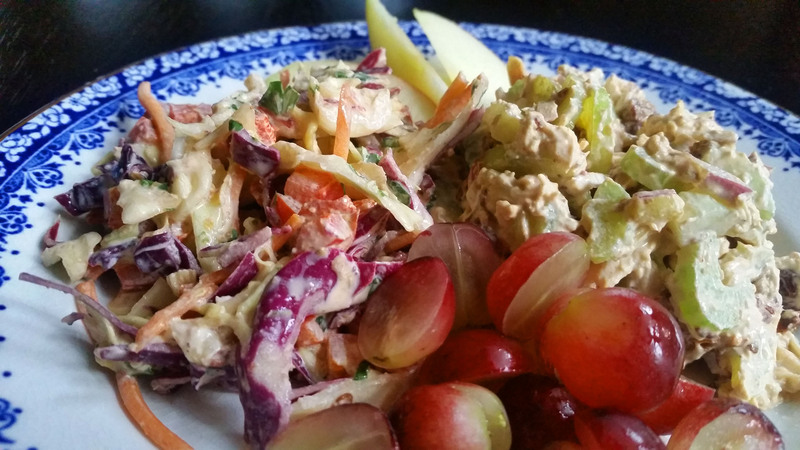 I decided to serve with cold grapes and apple slices, because I wanted to see which would be better along with that heat, plus I love a little fruit in my chicken salad. Grapes were the winner for me, although the apple was very good with it to…would even be nice with either one diced up and tossed in at the last minute! 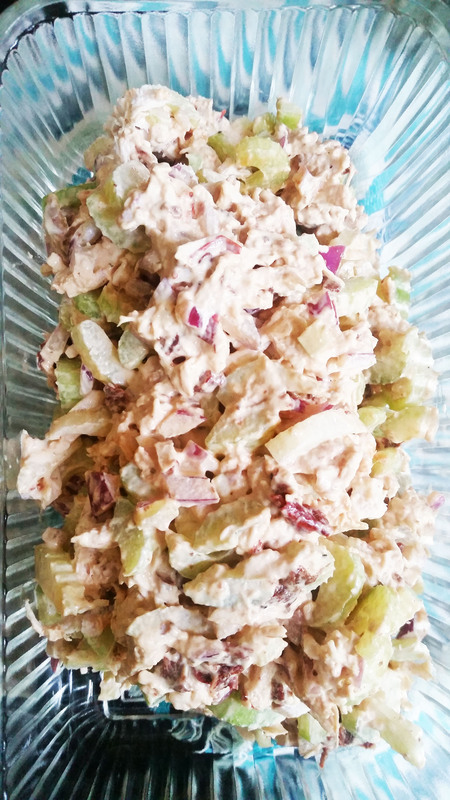 You will notice that dollop of mayo in the chicken salad prep pic above…this is the mayo from the book as well…(Easy Immersion Blender Mayonaise, page 78). 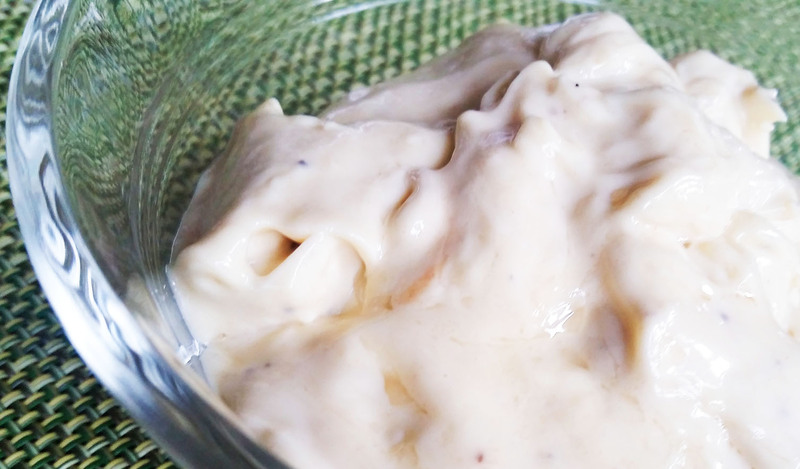 This is a nice mayo, more mustardy than my basic mayo (it’s on the blog as well). Simple ingredients, simple process with the immersion blender. My tip here? When you use an immersion blender, it eliminates the need for the slow drizzle of the oil into the mayo. 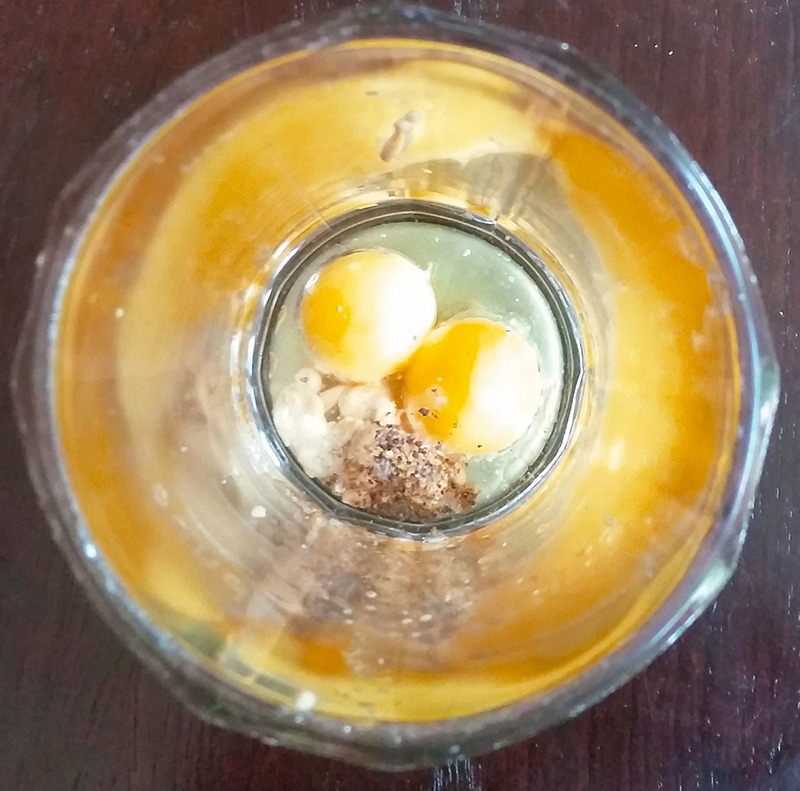 Dump all your ingredients in, including the oil, and put the blender wand all the way in to the bottom of the jar and blend continuously until you have the consistency you want. Easy! Let’s see…that puts my count at 4/152 (4 recipes completed out of 152)! Every. Single. Recipe! Let me know your thoughts, comments, questions…or if there is a recipe out of the book you want to see sooner rather than later!! 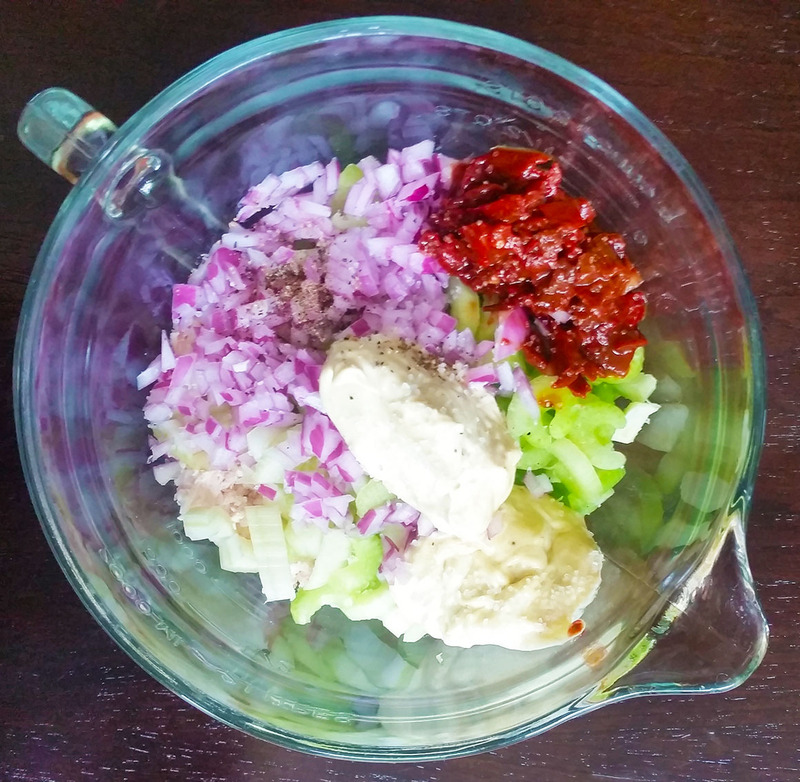 This entry was posted in cooking, food, paleo, primal, recipes and tagged #chef, #cleaneating, #cleaneatingwithadirtymind, #cookbook, #delicious, #everysinglerecipe, #foodie, #healthy, #paleo, #primal, #tasty, blogger, food, spicy by The One Called Paleo_K. Bookmark the permalink.